CAMBRIDGE, Mass. (AP) — Benjamin Zander’s eyes are shining, and he’d very much appreciate it if yours were, too. The internationally acclaimed conductor has spent half his life leading the Boston Philharmonic Orchestra, which he founded in 1979, and its spirited youth orchestra. And as the maestro approaches his 80th birthday on March 9, he shows no signs of stopping. Few could blame Zander if those dancing eyes went dark. His grandmother died in the Holocaust, and he’s had two failed marriages. But Zander is a serial optimist. 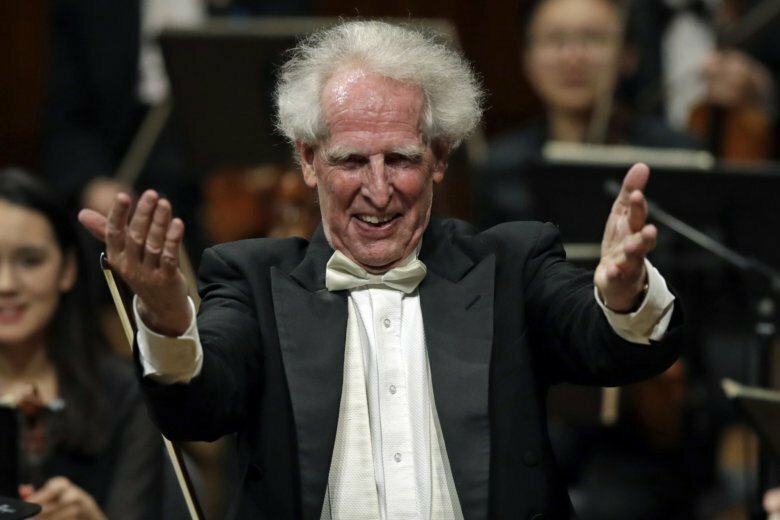 He’s a world-renowned conductor of Beethoven and Mahler; he’s a best-selling author who jets around the planet giving talks on leadership to foreign governments and corporations; and he recorded a viral TED Talk that has gotten nearly 11 million views. All that powers his mission to turn everyone on to classical music and its power to brighten the eyes and lift the soul. The Associated Press caught up with the British-born Zander in his home in Cambridge, just outside Boston. AP: You wanted to put a copy of Beethoven’s Fifth Symphony into the hands of every human being. Is that still a dream? Zander: My first wife, a great musician, said, “Ben, you’re a fool. Classical music is for an elite group of people. Don’t waste your time trying to make it available to ordinary people.” Many sensible people believe classical music is an elitist thing. I don’t believe that. I think anybody can respond to it. They just need a little guidance, so I provide the guidance. AP: Many would say that’s preposterous — you’ll never get everyone to appreciate classical music. Zander: Well, there are 30 million people in China alone who play the piano and 10 million violinists. In Mexico, they’ve got 85 youth orchestras. Classical music is spreading like the plague. There are more people listening to it now than ever in the history of the world. When you watch television and they’re selling an expensive object, what are they using? It’s always classical music because it lifts the spirit. It appeals to our best angels — our highest emotional, spiritual and intellectual selves. I’m not worried about classical music. I think we ain’t seen nothing yet. AP: What is it about Beethoven that’s captured your imagination? Zander: Beethoven is in all probability the greatest composer who ever lived. Now, that’s a silly thing to say because there’s Bach and Mozart. But think of the string quartets, the piano sonatas, the violin sonatas, the cello sonatas, the piano concertos. We haven’t even mentioned the symphonies. The range of Beethoven’s music is extraordinary. It’s such a beautiful idea that a man who was deaf and isolated and lonely and ill and cantankerous could actually bring the world together. He had a vision for human connection that’s been inspiring people for 200 years and will go on for another thousand. AP: You had family who perished horribly at Auschwitz. How has that colored your work? AP: Isn’t there intrinsic value in all music regardless of the genre? Zander: I’m probably not the right person to answer that. I don’t get excited about heavy metal. I love rap, but I don’t think of it as music — I think of it as language, as poetry. What I find most rewarding about classical music is the range and complexity of emotion it can express and the power that it has. That’s why at great moments like weddings and funerals and festive social occasions, people turn to classical music. It elevates everybody’s spirits. AP: Looking back at all the things you’ve done, what would you call your finest hour? Zander: I don’t see my life like that. I see it as a kaleidoscope of experiences of equal value. I really don’t draw a distinction between conducting Mahler’s Ninth Symphony and having a conversation with an 8-year-old. What I’m going for is shining eyes. If your aim is shining eyes, then life unfolds from one wonderful thing to another. AP: Will you ever stop? Zander: Why would I? I don’t see any reason to stop. You can’t be a welder or a bricklayer if you’re old, but you can be a conductor. I love what I do, and I intend to go on. I don’t have any hobbies. I don’t play golf, I don’t collect stamps, I don’t play tennis. This is my life. I’ll do it as long as I have something to offer.